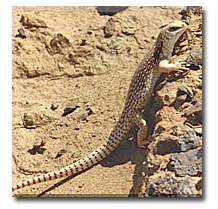 The mature desert iguana is 10 to 16 inches long with a large, round body and a long tail. It is colored brown around the head which diffuses into a reddish brown netlike pattern. It has tan or gray spots on the neck and trunk. The tail is gray or white encircled with rows of dark spots. The desert iguana is a wary, diurnal lizard that will climb into bushes seeking cooler areas in extreme heat, but it will remain active when temperatures are as high as 115 degrees F. It is considered a vegetarian and eats the flowers of the creosote bush, but will also eat various insects. It is not threatened or endangered at the present time. Mojave and Sonoran deserts of S.E. California, southern Nevada, S.W. Utah, S-central Arizona, E. and S. Baja California, N.W. Mexico and some of the Gulf of California islands. Arid, sandy desert regions. The desert iguana is found in the sandy desert regions living amongst the rock and creosote bush, which they use for shelter. They also find refuge in the abandoned burrows of the kangaroo rat. In the southern parts of its range, you can find it in arid subtropical areas and deciduous forest. 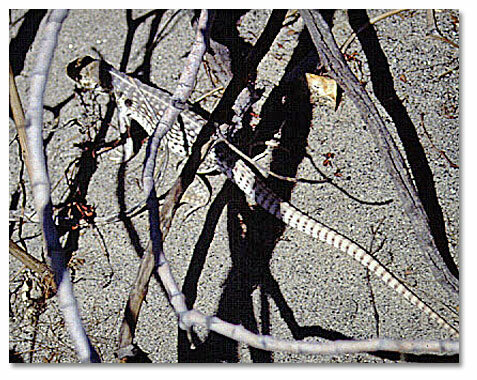 Desert iguanas come out of hibernation in mid-March and breeding occurs in April/May. They will lay 2-10 eggs between May and June, which hatch late July to August. Adults have a pink hue on the side of their belly during the breeding season.